The landscape that inspired the Brontë sisters to pen some of English literature's most enduring works is now the centre of a brewing storm over wind power. Thornton Moor near Haworth in West Yorkshire is the subject of an application by Banks Renewables. On moorland owned by Yorkshire Water, the company want to build four wind turbines. Each one would be 100 metres tall, and the four together would provide power for approximately 4,400 homes. Those opposed to the scheme include local residents and the Brontë Society, who think the moorland should remain untouched. Anthea Orchard, chair of the Thornton Moor Wind Farm Action group, told Sky News she was not being a "nimby". "We're used to windfarms here," she said. "But these will be twice the size and much nearer the houses. "It will also affect tourism, putting them on either side of the Brontë Way walk." 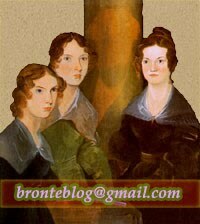 The talk was on Saturday – the 157th anniversary of Charlotte Brontë’s death. John Appleyard, who was in the audience, said: “Christa asked if anyone had a favourite quote from the Brontë books. Christa gave her talk at the table from which Patrick spoke from while he was curate at the church. John said: “Christa believed Patrick was a much maligned character, and wished to put the record straight regarding his life. He was born in Ireland of poor and humble birth. Due to his background it was a remarkable achievement for him to be admitted to Cambridge university. Flipping through the pages of the book, I search for the "Red Room of Pain," but happen, instead, upon the graphic description of an enigmatic billionaire deflowering the college-student heroine. The theme isolation is vividly portrayed in the two novels, Jane Eyre by Charlotte Brontë (1847) and Wide Sargasso Sea by Jean Rhys (1966). These two novels are well known throughout the world. They are classics. The characters, Jane, Rochester and Antoinette of these two novels are written so as to utilise the theme of isolation to provide a particular aspect of their identities. We have to add that only iPads have a problem with reading under direct sunlight. BellaOnline choose as Charlotte Brontë quote in a list of favourite business quotations; Mikaelas Filmblogg posts about Jane Eyre (particularly Jane Eyre 1944 and a 1946 edition of the novel with illustrations by Nell Booker); Eclectic Inspirations reviews the book; Chronicles of N reviews Jennifer Vandever's The Brontë Project; miextras uploads a 1989-90 live video of Mia Martini singing Cime Tempestose. Well, we don't know exactly. According to DVDActive (http://www.dvdactive.com/reviews/dvd/jane-eyre.html), there is no easter egg in the UK edition which seems strange. On http://bluray.highdefdigest.com/5439/janeeyre_2011.html, you can find how to open the easter egg in the US edition, but you probably already knew that.